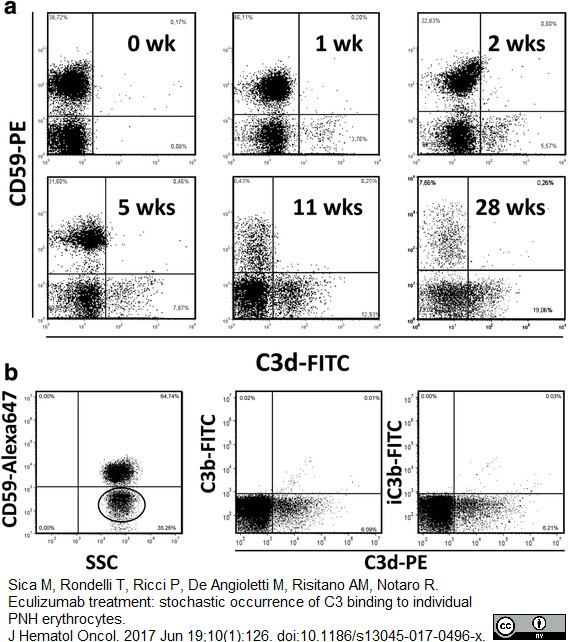 Mouse anti Human C3b antibody, clone H11 (0200-0614) used for the evaluation of C3b expression on CD59 positive and negative populations of human erythrocytes by flow cytometry. Mouse anti Human C3b antibody, clone H11 recognizes human C3b, part of the complement system. C3 is cleaved by C3-convertase creating C3a and C3b, which binds to the surface of pathogens leading to their destruction by phagocytic cells. Mouse anti Human C3b antibody, clone H11 recognizes a determinant present on native (circulating) C3 and on the fragments C3b and C3c. The antibody is directed to a determinant present on the betachain of the C3 molecule (Western blot). It does not react with the anaphylatoxin C3a or the fragment C3d and does not inhibit the haemolytic function of C3. Care should be taken during reconstitution as the protein may appear as a film at the bottom of the vial. Gentle mixing of the vial following reconstitution is recommended. 0.09% Sodium Azide, 0.5% Bovine Serum Albumin. These concentrations relate to the reconstituted product. Complement Inflamm: Abstracts Xlllth International Complement Workshop 6: 416. Hallström, T. et al. (2011) Immune Evasion of Moraxella catarrhalis Involves Ubiquitous Surface Protein A-Dependent C3d Binding.